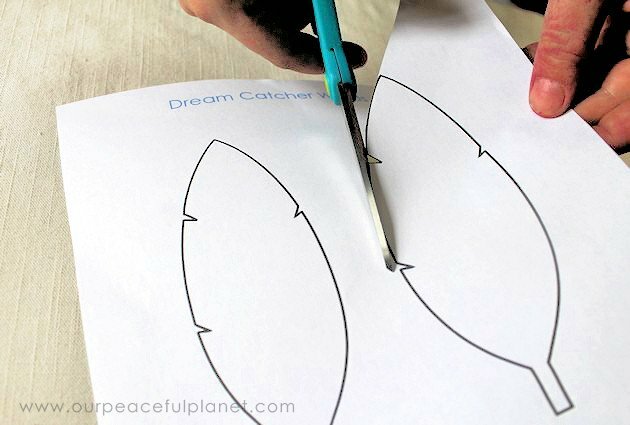 This isn’t your typical dream catcher! This beautiful, customizable work of art is a daily reminder of your hopes, dreams and aspirations. Fill it with everything that’s important to you and change it out as your dreams come true. It’s so easy to get so caught up in the day to day chaos that we forget what it is that we’re really working towards. Who couldn’t use a little daily reminder of their goals? And with an endless array of fabrics and colors, it’s sure to be an eye-catching addition to any room. Dare to dream big! 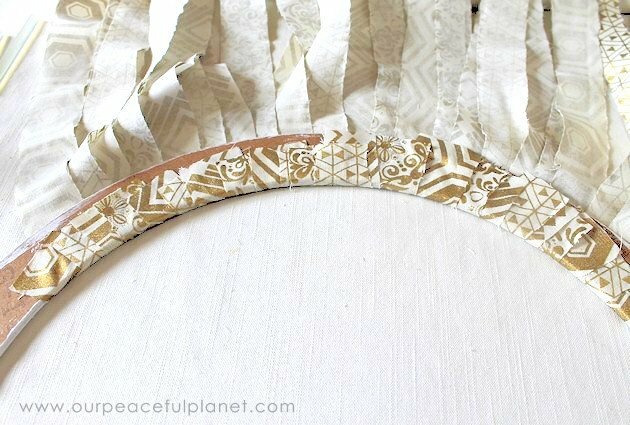 If you enjoy the simple DIY feathers in this post you’ll definitely like our Reusable Car Air Freshener feathers! 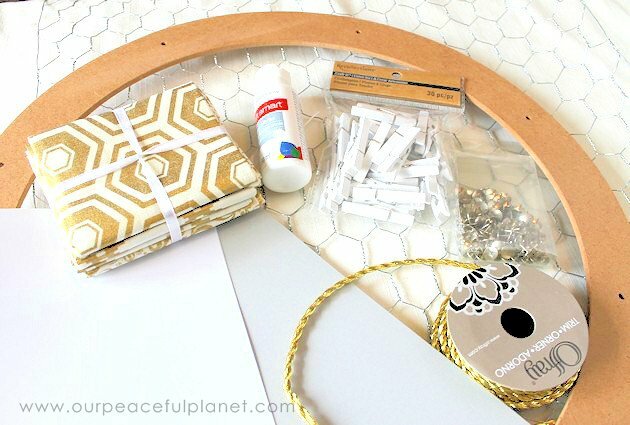 This post also goes along with our other wall decor in DIY Frugal Bedroom Wall Ideas. NOTE: We purchased a group of Fat Quarters (Pack of 18″ x 22″ rectangles) and used 4 of the 5 patterns given.) The dream catcher is very customizable to your own taste and colors. Small white clothespins aprox. 2″ long. 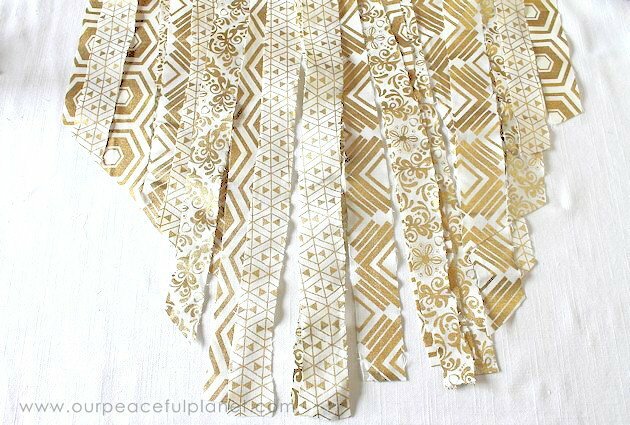 Braided Gold Trim to glue to feathers. 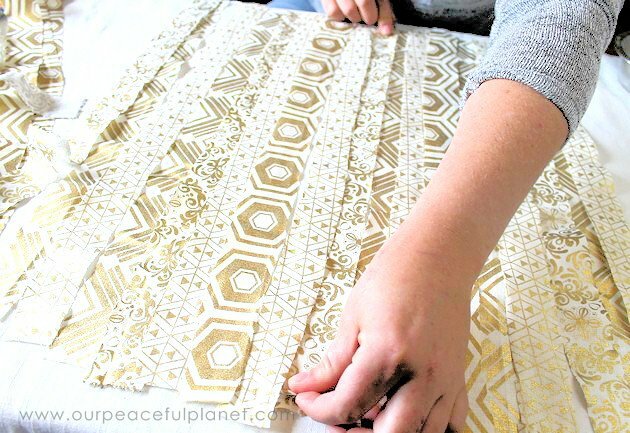 Cut into approximately 11″ 13″, 18″ and 22″ pieces. Paint one side of the wood floral craft ring in the color of choice. We used white to fit with our color scheme. 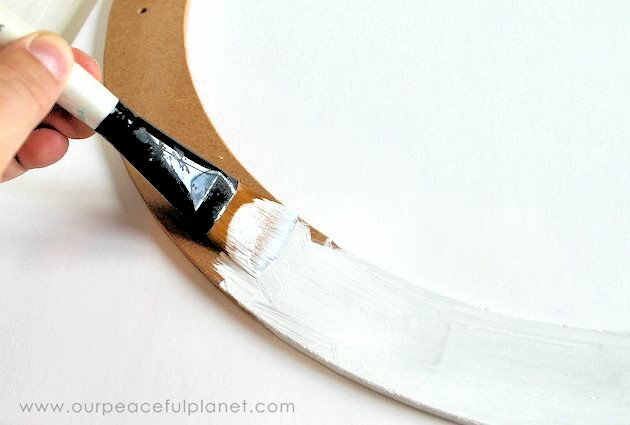 Be sure to cover the edges of the ring with paint. Apply additional coats as needed. 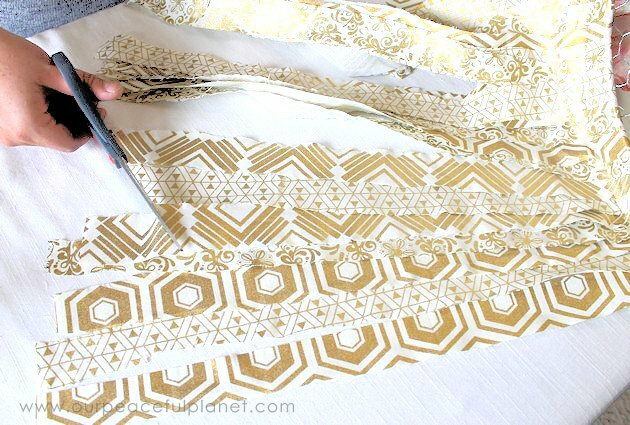 Cut strips from the fabric, approximately 1-2″ wide and 18-20 inches long. Keep in mind that the strips will overlay one another when complete. 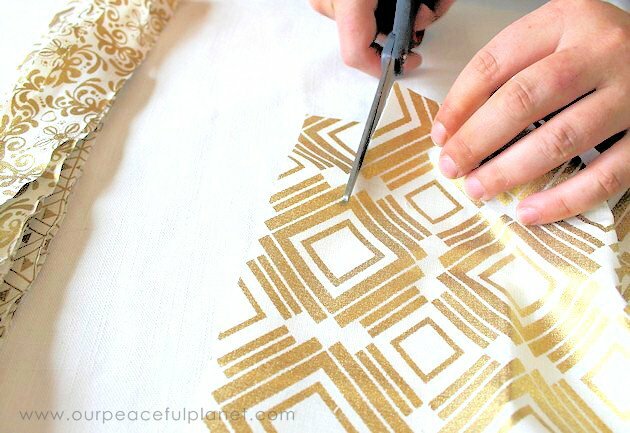 Lay the cut pieces out, overlapping edges, until the desired look is acquired. 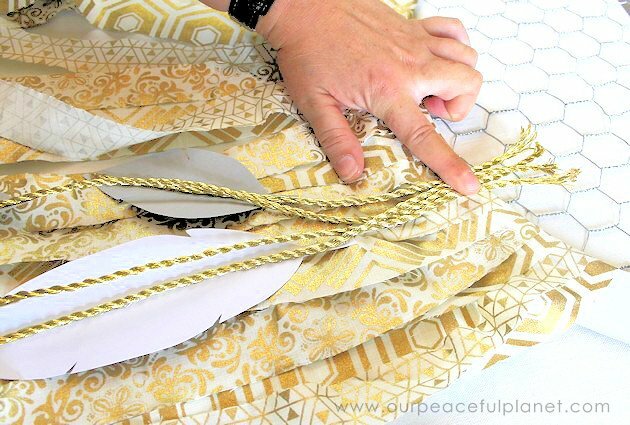 The fabric pieces should fill approximately 1/4 of the ring, as shown. 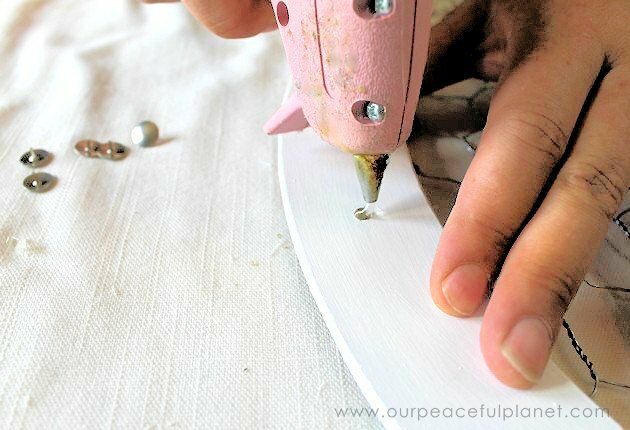 Apply hot glue to the painted side of the ring and begin applying fabric strips. Layer the strips of fabric about 1/2 an inch over one another, working from one side to the center at the base of the ring. 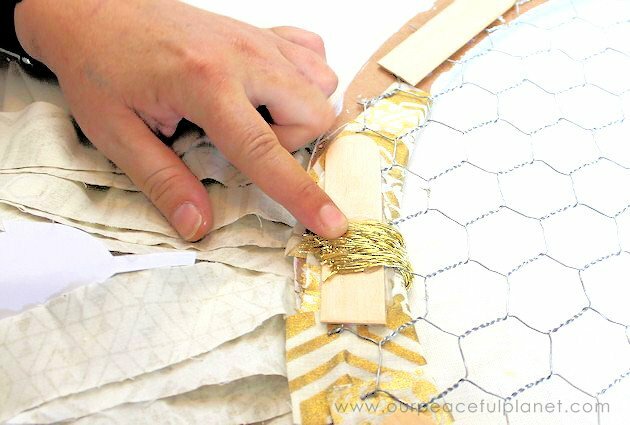 Once fabric reaches the base, begin at the opposite side and work towards the center again. 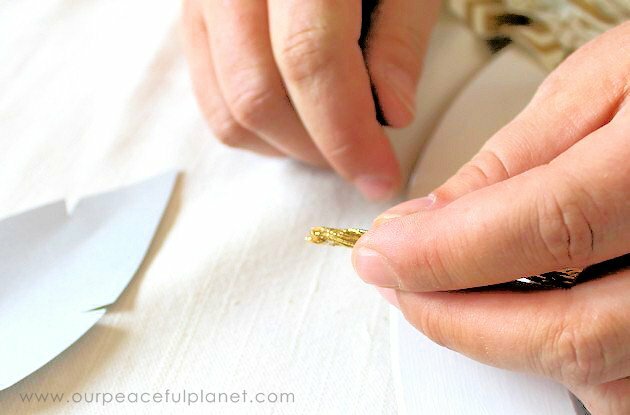 The final pieces of fabric should be applied over the bottom (middle) of the ring. 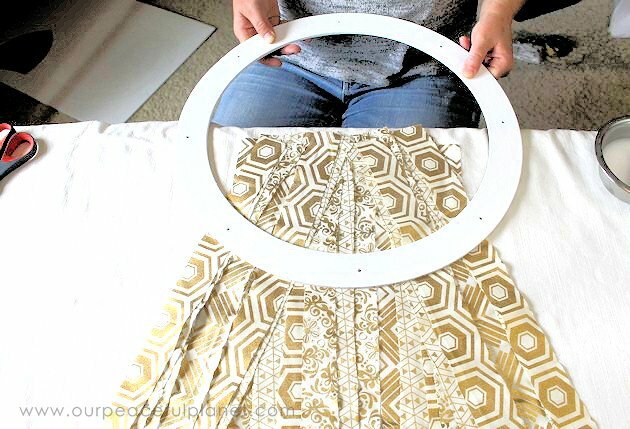 Once fabric is applied, flip over the ring as shown. 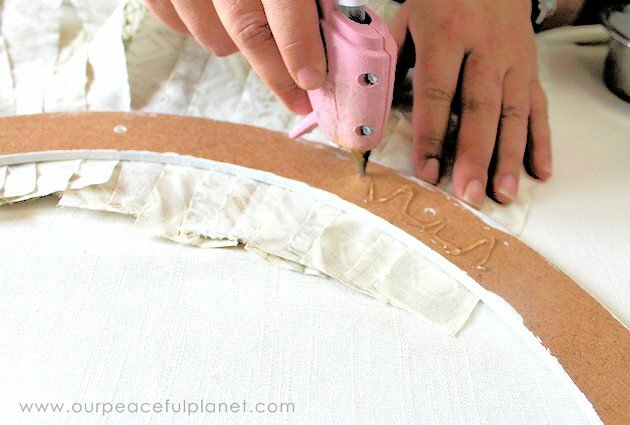 Apply a generous amount of hot glue to the back of the ring and pull fabric around. Pull tightly to ensure a smooth finish. Additional hot glue may be needed to hold down rogue edges. Remember that this is the back and perfection is not necessary. 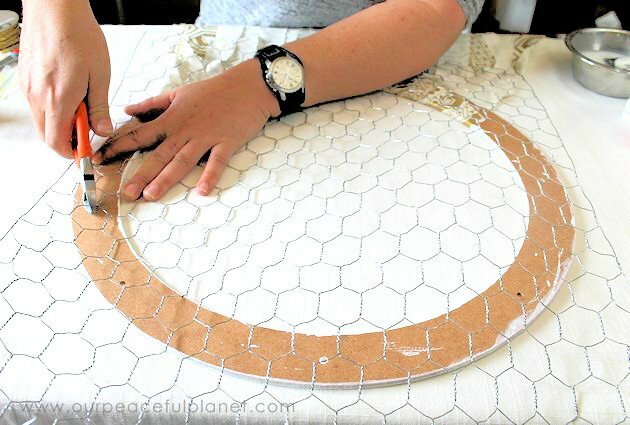 Lay the piece of chicken wire across the back of the ring and bend flat. 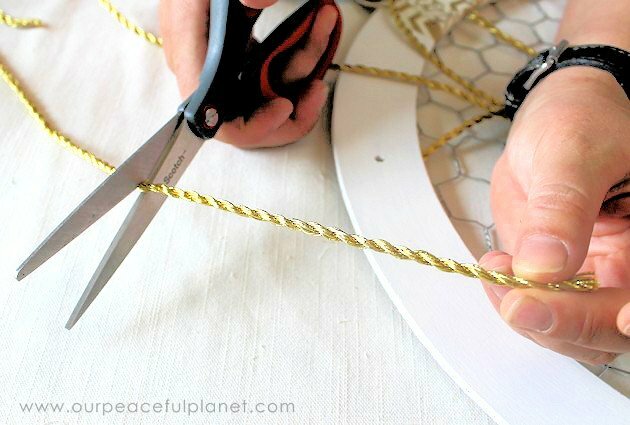 Using wire cutters, trim the chicken wire to fit inside the ring. Be sure that the wire is cut as close to the edge as possible without being visible from the front. This gives ample room for adhering the wire to the back of the ring. Once complete the wire should appear as shown. Be careful when handling wire to prevent pokes! 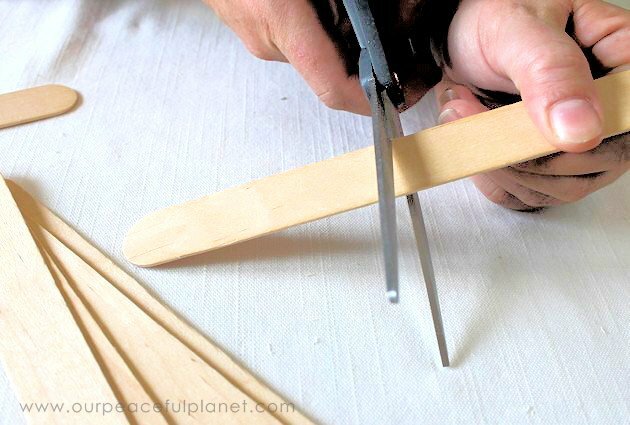 Using scissors, cut the wide craft sticks in half. 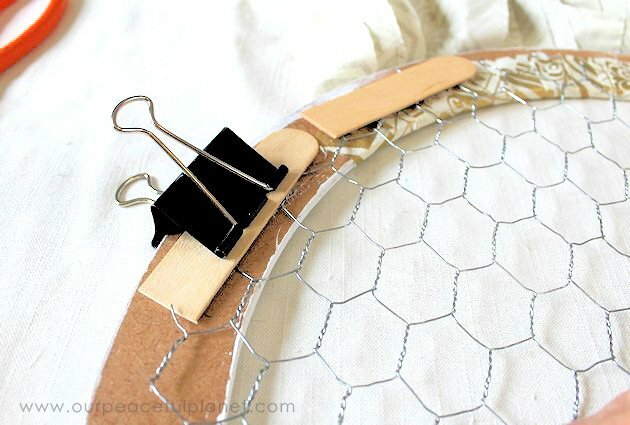 Apply a generous amount of hot glue on top of the chicken wire and press the craft stick pieces down onto the hot glue to hold the wire in place. This requires a bit of patience as each piece must be held in place until dry to avoid a broken seal. Little trick: use office binder clips to clamp pieces in place until dry. 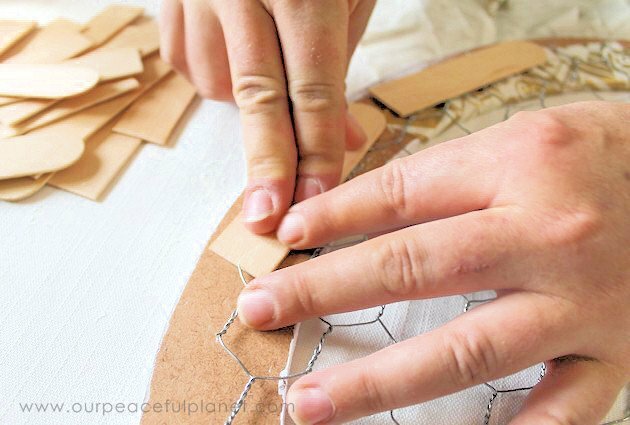 Move around the ring, applying additional glue and sticks. Print the FREE DOWNLOAD onto colored cardstock of choice. We used white and grey cardstock to fit our color scheme. 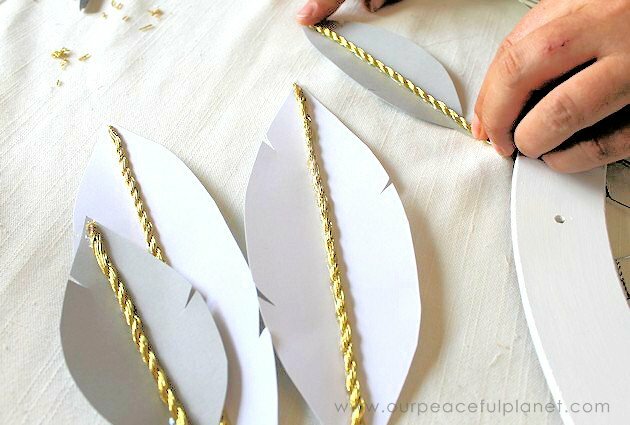 Be sure to cut inside the black line so that the finished feathers are nice and clean. 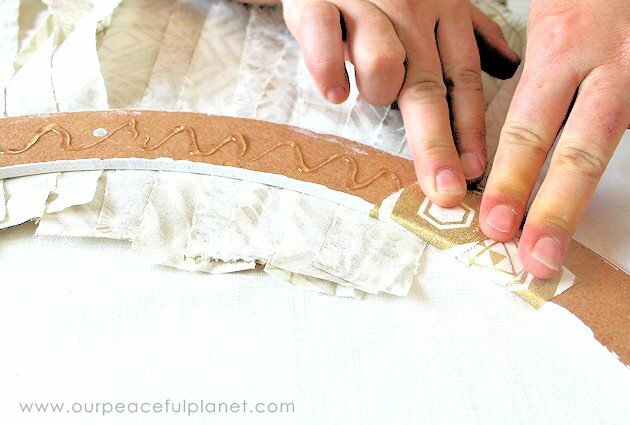 Lay the ring right side up and smooth out the fabric pieces. 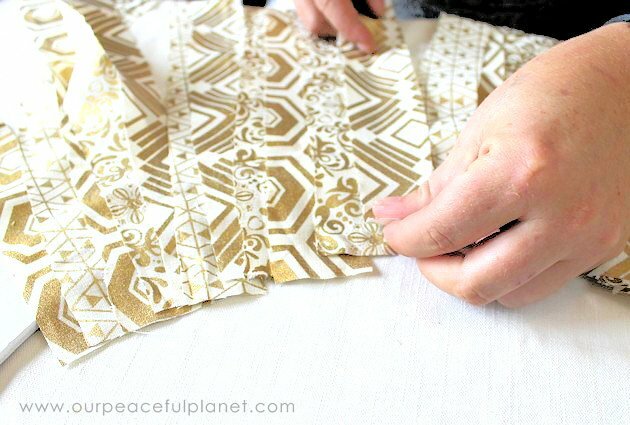 Starting at the center, trim the fabric up to each side at an angle. This creates a beautiful tapered look when hung. 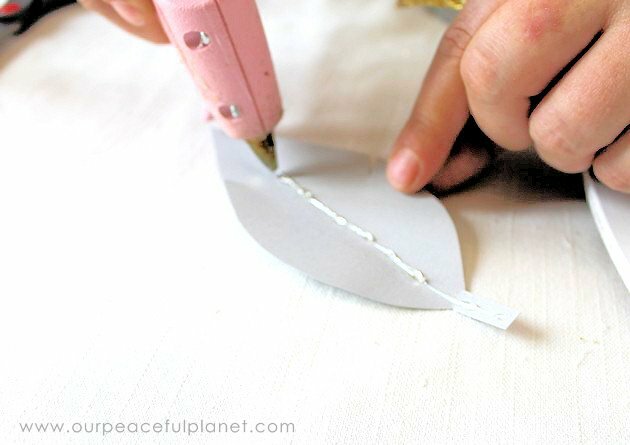 Apply a small dab of hot glue to the edges to prevent fraying. This gives a nice clean end to the trim. 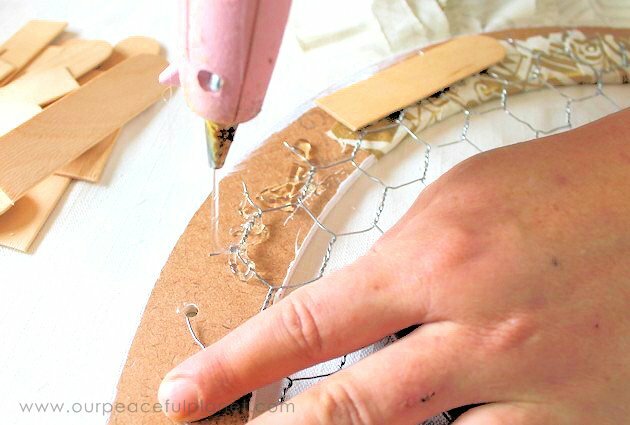 Apply a line of hot glue down the center of each feather cutout. 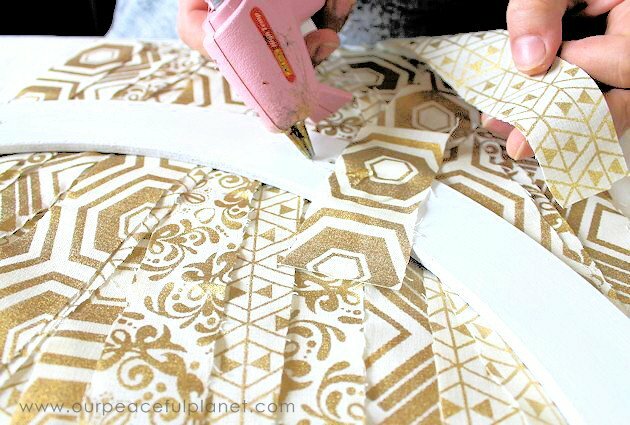 Lay the gold trim over the hot glue with the finished (glued) end at the tip of the feather. 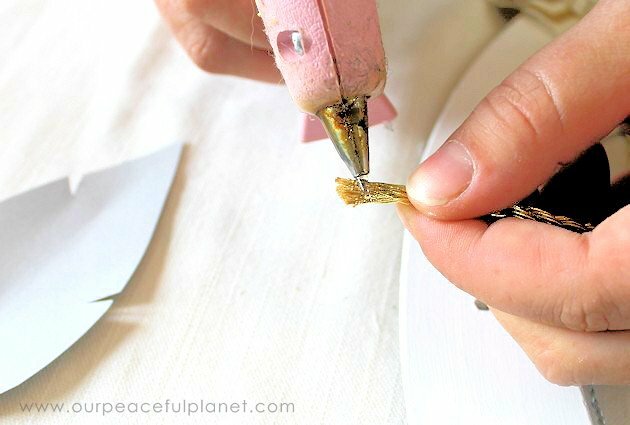 When dry, gently fold the feathers inwards using the trim as the center. This gives them a lovely three dimensional look when they hang. 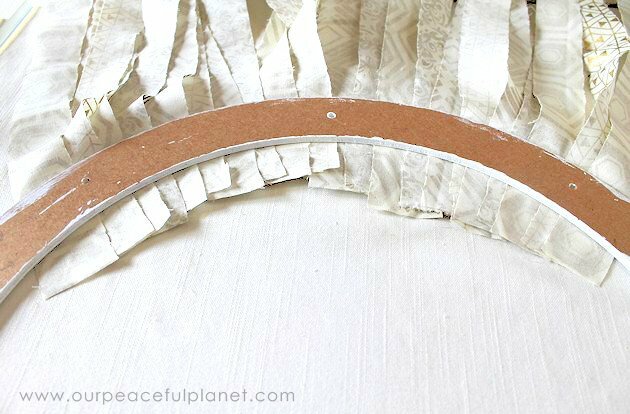 Gather the ends of each piece of trim and line them up on the ring. Placement is really based on preference. We chose to hang ours slightly off center. 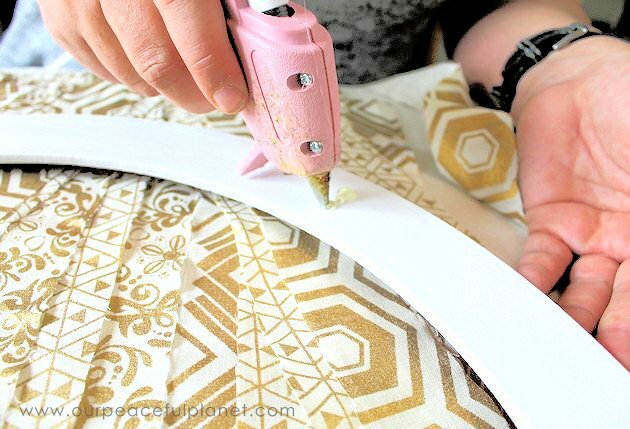 Once placed, apply hot glue behind the trim and then hold into place until dry. Be sure that there is 1-2 inches of trim hanging above the hot glue. 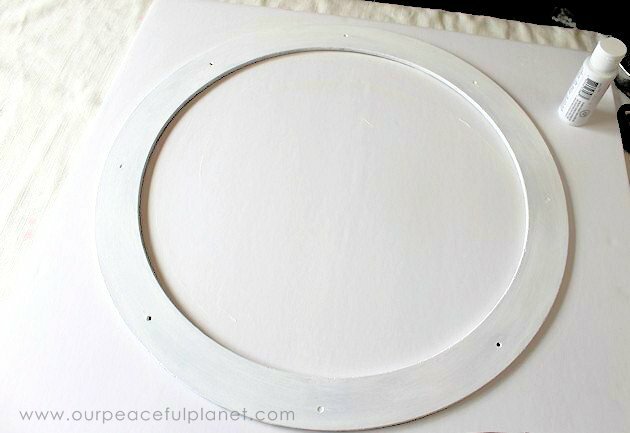 Flip over the ring and apply hot glue to the back of where the trim is overhanging. Pull the trim ends through the wire and press into hot glue to hold in place. Pull tight for a smooth finish. 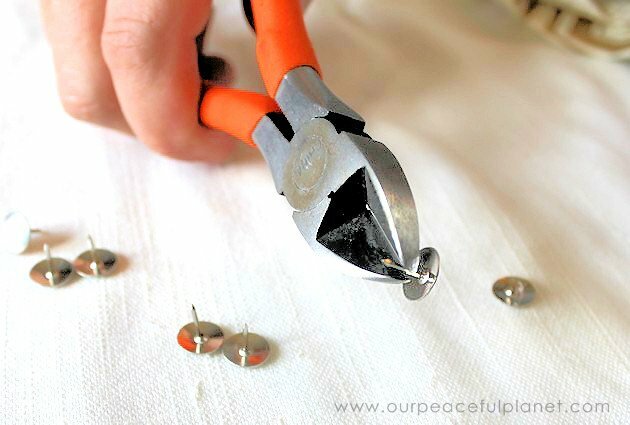 Using wire cutters, cut off half of each pin on the thumbtacks. These little guys can go flying! So be sure to angle the pin downwards, towards the table, when cutting. 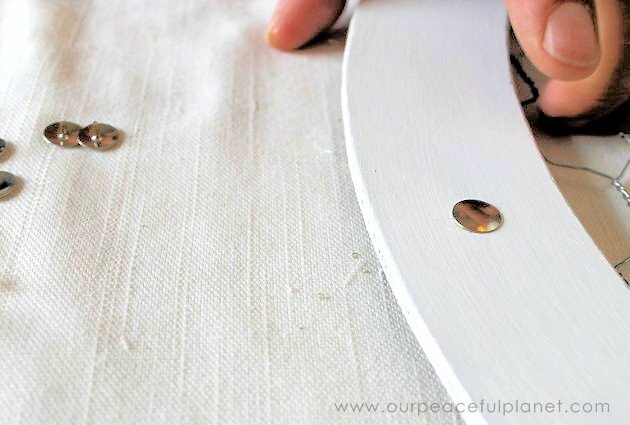 Place a drop of hot glue into the pre-made holes on the craft ring. Insert the cut thumbtack into the hot glue. 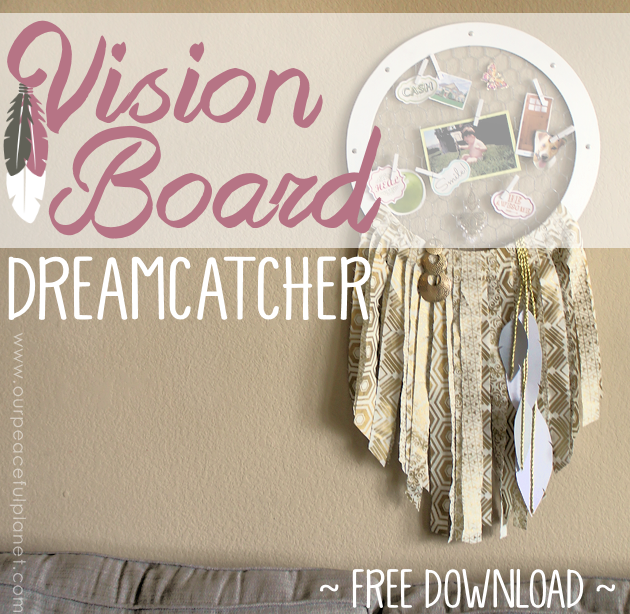 Finally, using small clothespins, fill the Dreamcatcher Vision Board with hopes, dreams and aspirations. Check out our FREE DOWNLOAD of positive words to get started! I understand now why you didn’t use staples from staple gun. 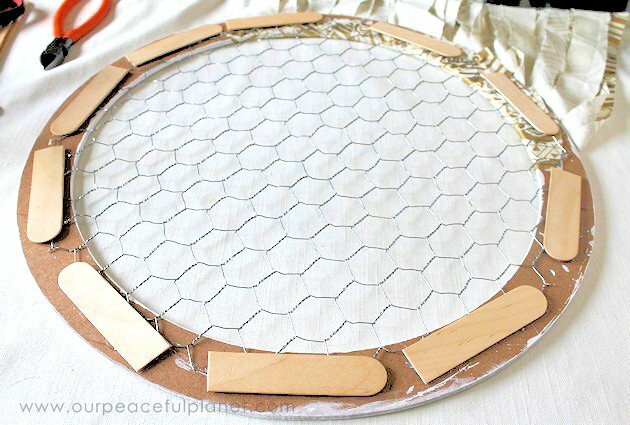 Another idea to hold wire into place is to wrap hemp cord or leather around the board.and through holes of chicken wire. Then hot glue the end of string on back side of board and trim if needed. I think I would like to do my colors using Native American colors. Red, White, Yellow & Black. 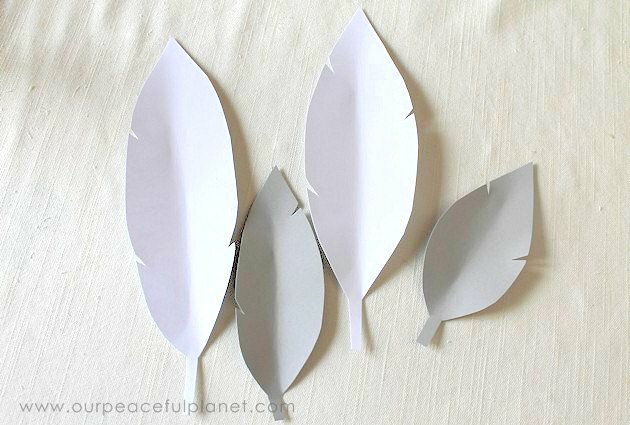 Do this with feather colors and board one color. If you want you can also paint side of chicken wire facing out one of these colors, different from board. 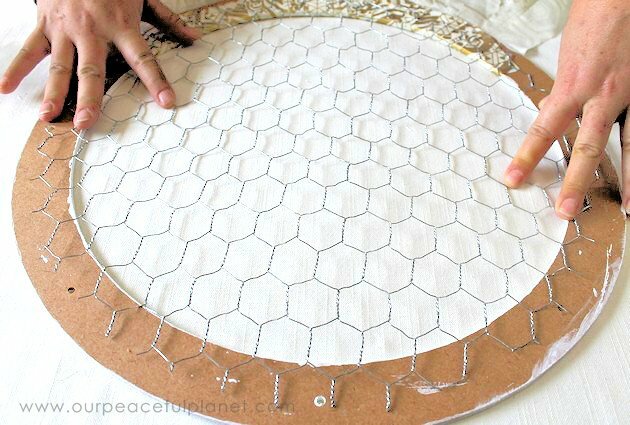 You can also use yarn in red, black, yellow & white when wrapping around board to hold chicken wire into place. Just alternate the colors. Maybe add the same color beads to string pieces alternating those as well. Excellent ideas Barbara. Thanks for sharing them. I’m so glad you found the post inspiring! I love this and plan to make something like this. I’m going to try and adapt it to hold jewelry by using S Hooks with it. Ah that would be another great use for it! Thanks Jean for stopping by! What a fun project! 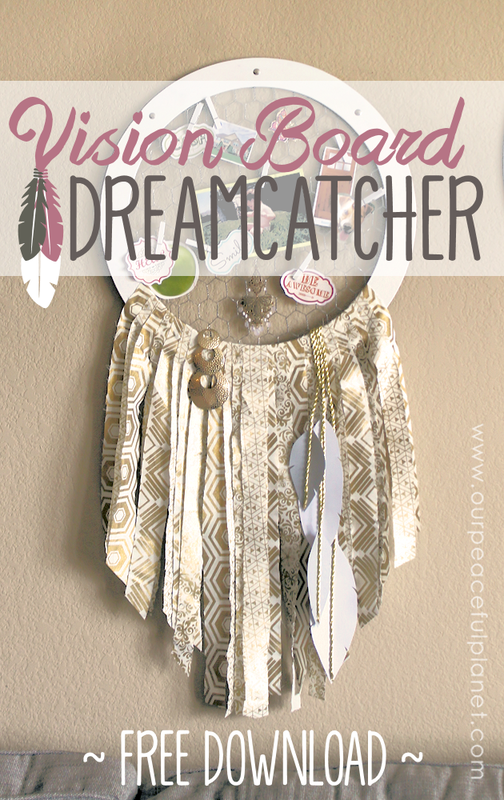 I’ve always loved dream catchers and I enjoy making vision boards. Love how you combined two great things together into one fun project 🙂 Thank you for sharing this with us over at Dishing It & Digging It. Wow!!! I SO LOVE THIS!!! What a great idea! Thanks for sharing at our Craft Party on Thursdays! We would love to see your next projects or recipes! 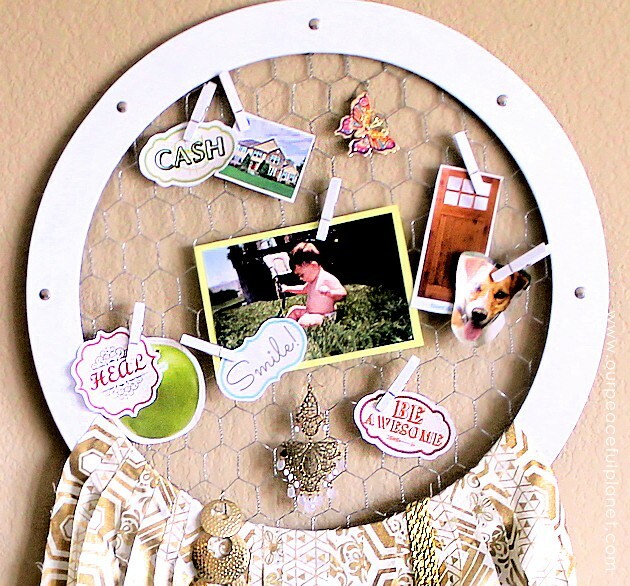 Love this idea for my office /craftroom, so cute. Can you tell me where I can buy the tiny clothespins pls. they really add to the dream catcher but i am in a very small town and that is something i just don’t see anywhere ? Thanks for sharing your project with all. I love this! It is absolutely beautiful and such a creative idea! Nice job! Could I use these for a craft show or do you have a licensing fee for your designs? Hi Jeanne! We do ask for a small percentage fee for each item sold for ideas that are specifically ours, which this one is. I’ve just starting doing this on a couple of items we created. Can you give me a few days to finish getting my info together? Then I’ll send you the info at that point. Thank you so kindly for asking. Beautiful. But wouldn’the it be easier to staple rope over the edge of the chicken wire in the back, the secure the rope with glue? that would very well be. Several suggested stapling it but our staples would have gone through the thin ring. As long as it holds that’s all that matters! I love this and that you give us great instructions!Thanks!